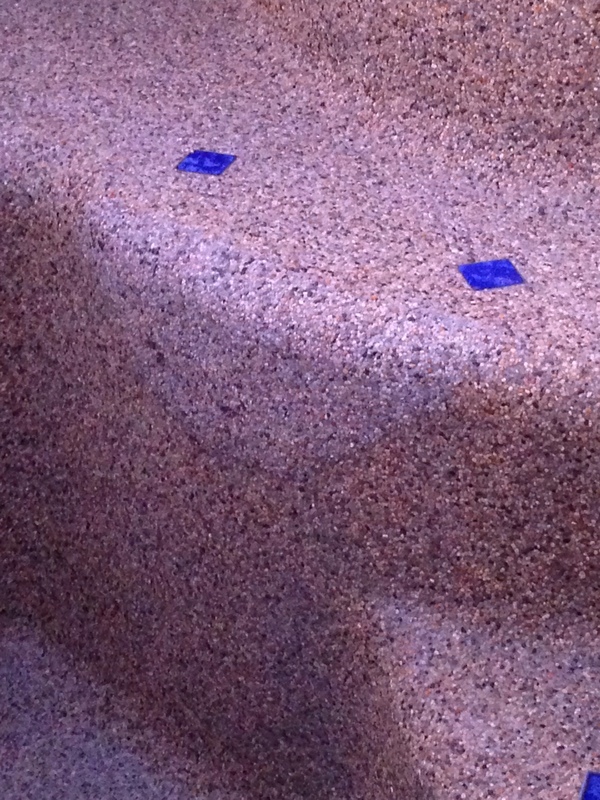 Crack in PebbleTec Spa Step - Rebound issue or Salt System? I had a pool and spa built in April of 2011. 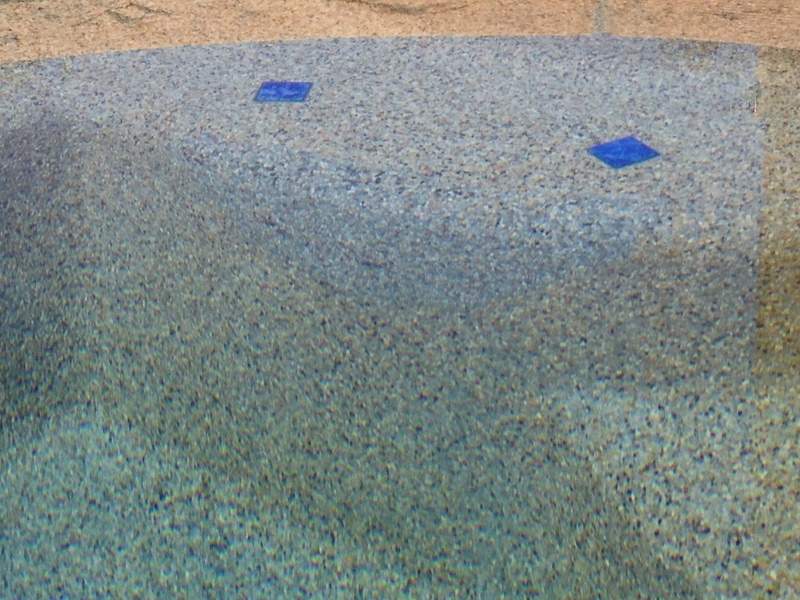 The pool and spa shell is shotcrete with a PebbleTec plaster finish. When the pool was built, the builder specified a tri-chlor tab feeding system. After the pool was completed, he brought in his "startup" person who wired everything up and got everything running. I then hired him to maintain the pool on a weekly basis. After one year, my conditioner levels were over 350ppm and we were having a terrible time keeping algae at bay unless chlorine levels were over 8ppm. At the recommendation of several friends who've owned pools for years, I drained the pool and had a Pentair IntelliChlor salt system installed and I've been a happy camper ever since. Conditioner levels are low but effective and chlorine hovers around 1ppm without any issues (and yes, all other levels are in check). My spa top step has developed a crack at the top edge about 10" long and about 1/8" wide. I called my builder and he said the crack is caused by using salt as the chlorination source. He claims that salt gets into any microscopic pore and creates a "fracking" effect, and this is why the crack has appeared. He said all bets are off when any pool uses salt. So with that, I called an independent pool structural engineer who said that blaming salt or any chemical imbalance is "BS". He said that more then likely there is an underlying issue with the shotcrete, and that he's willing to bet that ""rebound" will be found when the plaster is removed to investigate the issue. He added that one can blame salt and/or chemical issues for plaster discoloration, eroding the surface, causing issues with coping where water has been splashed/dried and salt left on the surface, etc - but not for deep cracks like this. I've attached an images of the crack, and one of the spa shell while it was curing. Your Pool Builder is doing all he can to not honor a warranty claim that he knows is not caused by your saltwater system. I would ask him to provide you with some written engineering proof of his comments. Let's see if we can get some more technical answers from our other members.. Thank you Jim. I also called a highly respected pool plaster company (they also build/remodel pools) and they too stated that salt has nothing to do with it - and in fact they offer a ten year warranty on plaster finishes regardless of how the pool is chlorinated. Any further technical expertise I can learn here will help me negotiate with my pool builder. agree, don't blame salt . if you were there during the plastering you will remember the last areas to get plastered is the spa & specifically the spa steps also the pool and more specifically the steps , by the time the plasterers get to those areas the plaster material has more than likely began to set up, and or they have to add water either via sponge or spray bottle to the areas to help work the plaster , i have seen this many times in our area & most always the steps & or seating area in the spa will fail then the pool gets acid washed later that day or the next coupled with that & depending on your water press your plaster was " dry " for quite awhile . That's after they hammered it out. It was essentially a small plaster bubble or delamination from the gunite. Happens a lot at rolled edges of steps. That last one is under water. The plaster surface is most likely faded so any patch will stick out. Thank you Matt, extremely helpful. Unfortunately I wasn't there for either the gunite or plastering phases, so I can't say what was done/when. Re: my contractor, he states that he cannot recommend salt systems because he's seen a "ton" of issues related to coping and plaster from these systems - and for that reason, he won't provide any warranty service if the pool has been converted to salt. But every other pool builder I talk to says they see no issues with salt. If salt "is" the issue, why wouldn't I see the same thing happening all over the pool on any surface with steps (baja sshelf, steps leading into the pool, etc.)? I see you're in Laguna Hills, not far from me in Dana Point. I wasn't there for the gunite/plastering phases, so I can't say what may have happened. Given the pool is only five years old, I'd like to press my builder to at the very least, share in the cost of repairs. My fear is IF this is a "rebound" issue and all the steps and bench were done this way - will they all fail? Re; CYA, yes - it's true that when this occurred, my builder didn't really know what I was talking about. Only after doing my own research did I discover my CYA levels were thru the roof. My pool maintenance guy (same guy builder sent to start the pool) didn't even carry a test kit that can measure CYA, so he had no idea that only one year of 3" tabs had driven the CYA way sustainable levels. You mentioned that if the crack isn't leaking, leave it alone. How do I know if it's leaking? It's not salt. That is simply pool builder B/S that allows them to get out of the warranty. Does the warranty specifically limit claims if salt is present? What does the warranty say? What you have is plaster rebound causing a bubble or delamination between the gunite and the plaster. Typically very smooth gunite surfaces have poor adhesion to plaster and rolled surfaces near a step edge exacerbate the problems with plaster rebound and delamination. It's a plaster issue NOT a chemical issue. Can you isolate the spa and watch the water level for a day or two? If it leaks, you'll see it. My guess is, it doesn't. Another potential cause is the plaster being exceptionally thin in that area. When the plaster is applied is often difficult to know how thick it actually is especially around the edges of corners. Does it sound or feel hollow if you tap it? Just to be clear - is "plaster rebound" the same as "gunite rebound"? Yes I can and I did, and other than evaporation, I can't detect any leaks. I'll have to drain the spa a bit and check the area. I'll let you know . . There really isn't rebound with plaster since it isn't applied under pressure. What does often happen is over troweling and adding excess water to material that has already set up. This is common in spas because they can take just as long as the pool to trowel but there is really only enough room for one person to work. Thanks, extremely helpful. Well, armed with this info I'll approach my builder and see what happens. He has always been extremely fair but when it comes to salt, he says he "draws the line" given he has "seen too many plaster issues due to salt systems." People who work with him say he's awesome, but once he "thinks" some element (baseless or not) is causing problems with his pools, he puts his foot down and cannot be convinced the problems may be caused by other issues. On that note, does anyone have any idea of the cost of re-plastering an 8' spa w/Pebbletec? I was quoted $3,200 by a well known and highly regarded pool plaster company. They said they would normally only charge $1K to add a spa to a pool+spa job, but the cost is high because they have to get all the gear/truck together for just the spa anyway . . They provide a ten year plaster warranty against cracking/delamination. It's not a salt issue. Rebound would be a gunite thing. 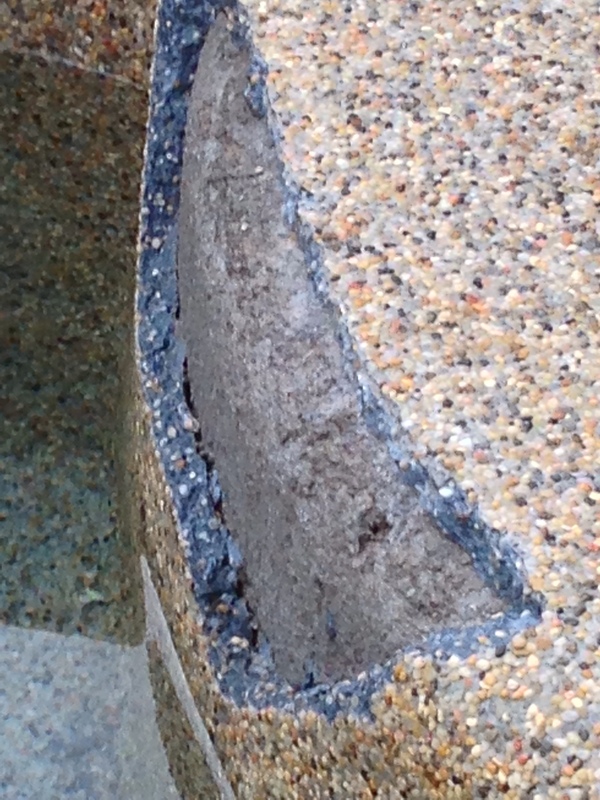 If the crack was coming from cracked gunite, rebound might be an issue. As noted, it's probably just a bubble in the plaster where it delaminated. As shown above, it can be patched if you want. It's not a really big deal either way. To see if it's leaking, you can use some dye to see if it gets sucked in. Here's another point in your war of ideas with the PB - every pool is a "salt" pool. Anytime you add chlorine to a pool either from liquid chlorine, pucks or powders, then end result is chlorine turns into chloride. Muriatic acid is HCl...guess what that adds? More chloride (Cl-). Most people find when they go years using pucks and then decide to switch to an SWG, their water already has 1000's of ppm of chloride ion in them so much so that they barely have to add any salt to get the SWG to work. ... And not to mention the the swimmer's salty additions... I'm not talking about sweat! You sure your plasterer wasn't Jeff Kerber Pool Plastering? There are (were) two "Kerber" companies from my understanding; Kerber Brothers and Jeff Kerber. I believe Jeff broke away from the brothers and started his own company if memory serves me right and is still in operation. Kerber Brothers is no longer - their number has been disconnected and their website is down. My builder confirmed they're no longer in business. My gut feeling in this is to leave it alone. If the crack is not leaking, and it sounds like it's not, then it's more hassle than it's worth to get a plasterer to patch it. When I contacted my plasterer about it I was under warranty and they said they get right on it. That was May 2016. Those patch photos I sent you were from December 2016. So 7+ months to get a valid warranty job done and that was with me calling them every two weeks to hear the latest B/S excuse for why they couldn't get to it and that I was on the top of their list. And, this was from one of the busiest and long running plasterers in my area. There are two part epoxy materials that cure under water that can be mixed up, colored and jammed into the crack to hide it. That will work a lot better than chipping out the plaster and putting a patch in. And, as you have discovered, pretty much no plaster company is going to want to waste their time doing a patch. They're all going to want to do a full chip out and replaster.